For the past two nights, my little girl has slept the whole night in her crib in her nursery by herself. It wasn’t exactly planned, but we knew it was on the horizon. She is getting too long for the bassinet we keep by our bed, plus she has become a pretty good sleeper, and I was starting to feel (or at least wonder if) we were disturbing her more often than the other way around. Part of me is wistful about the change. Even though we had to keep a light on and a fan running, it was nice to have her next to me. I could just peek over at her sweet face anytime I wanted. But a bigger part of me knows that this is best for her, and that’s what’s most important. That’s what growing up is. Little steps toward independence. Luckily we’ve still got a long way to go. Well, the first two months were just survival, lol… But she/we turned a corner around 9-10 weeks, and things have just been getting more fun ever since. I honestly can’t wait until she’s a “real” kid — like ages 3-10. 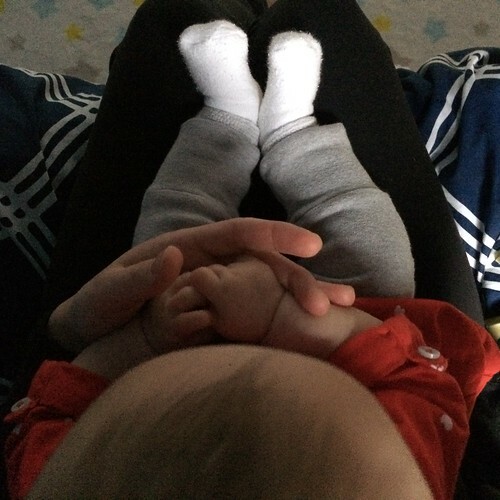 Aww, that little point of hair and those little clasped hands, it could be my baby in that picture. Except we’re in Florida so she never wears socks…or even pants most of the time. Haha. What age do you think you’ll like the best in the 3-10 range? 8 is pretty awesome right now with the twins. They read to me and one of them has her own folder on my computer filled with her stories (swoon). I read them HP1 this past summer and it was like I was reading it for the first time again, their reactions were that good. (“Dumbledore! Mommy, its Dumbledore!”) Right now they are doing HP5 on audio at bedtime and then we talk about it. The 3 year old is… Well lets just say thank goodness he is so darn cute and I love him so much because he is like Tasmanian Devil (did u ever see those cartoons) right now. He will climb a chair and eat all the cookies in the top cabinet then draw a race track in marker on my bedroom door, take me by the hand and present it to me “Wook, mommy a twack! A wace twack!” with his little chocolate outlined mouth. How can you be mad at that, right? (Ask me again when I’m musculing that track off the door with a magic eraser). In hindsight, Id say my favorite age is 3-9 months. Anyway, its fun to see your baby growing! Yeah a friend has a baby about the same age as IB, but they’re in Florida, and it’s hilarious how differently our girls dress! I *think* I will enjoy 4 the best. Mainly because I remember being a pretty awesome 4 year old myself, lol? It just seems like such a sweet spot of cute, cuddly (sometimes), curious, coordinated, etc. Omg I cannot WAIT to read my favorite book series with her through the years. Amelia Bedelia, Magic School Bus, Anne of Green Gables, Chronicles of Narnia, Harry Potter…!!!!! Lol I know the Tasmanian devil cartoon well. Your son sounds like a hoot! Good to know, re: 3-9 months being your fave in hindsight. I’m definitely trying to savor this.